Praised are You, Our God, Ruler of the universe, Who made us holy through your commandments and commanded us to kindle the Hanukah lights. Christmas brings enormous electric bills. Candles are used for Hanukkah. Not only are we spared enormous electric bills, but we get to feel good about not contributing to the energy crisis. Still ours the dance, the feast, the glorious psalm; the mystic lights of emblem, and the word. The commandment to light the Hanukkah lamp is an exceedingly precious one, and one should be particularly careful to fulfill it. In order to make known the miracle, and to offer additional praise ... to God for the Wonders which He has wrought for us. Put on your yarmulke, Here comes Hanukkah! So much funukah, To celebrate Hanukkah! Hanukkah is the festival of lights. Instead of one day of presents, we have eight crazy nights. 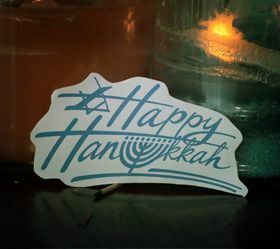 Hanukkah is a Jewish festival which is also called as the "Festival of lights" or the "Feast of Dedication". This festival is celebrated over a period of 8 days, somewhere in late November. Hanukkah is celebrated by kindling the lights of a unique candelabrum i.e. The nine-branched Hanukiah. One additional light is kindled each day, thereby making the total number of lights kindled as eight on the final day. Hanukkah commemorates the rededication of the Holy temple of Jerusalem at the time of Maccabean revolt against the Greeks. The Hanukiah consists of eight branches with an additional branch for an extra light which is called the Shamash. The purpose of the Shamash is to have extra light available for practical usage and purposes. The usage of other lights is confined to publicizing and meditating. Hanukkah is a Modern Hebrew word which translates into establishing or dedication. It begins on the 25th day of Kislev as per the Hebrew calendar.